“When things get really bad, just raise your glass and STAMP your feet and do a little jig. That’s about all you can do.” Leonard Cohen. Up here on the north coast, in western NY, we are trying to figure out how to do the same thing that cities and regions around the world are simultaneously trying to figure out: how to create a more robust and sustainable economy, attract investment, sponsor innovation, and work to solve all of the problems that beset us. We’re all (and here I mean ALL) in a mad dash to find a better future. Here in New York, the State has been subdivided into eight Regional Economic Development Councils (REDC), and these Councils compete for State dollars to fund projects that theoretically will build foundations for a useable future, help our cities, take best advantage of our assets, and help to map our best futures. The REDCs are made up of elected officials, institutional and educational leaders, and business executives – we hope our best and most far-thinking. Recently our state elected officials, teaming with our local REDCs, announced a $33 million plan to begin to develop a 1,250 acre Science, Technology and Advanced Manufacturing Park (STAMP), to be constructed in Alabama New York. 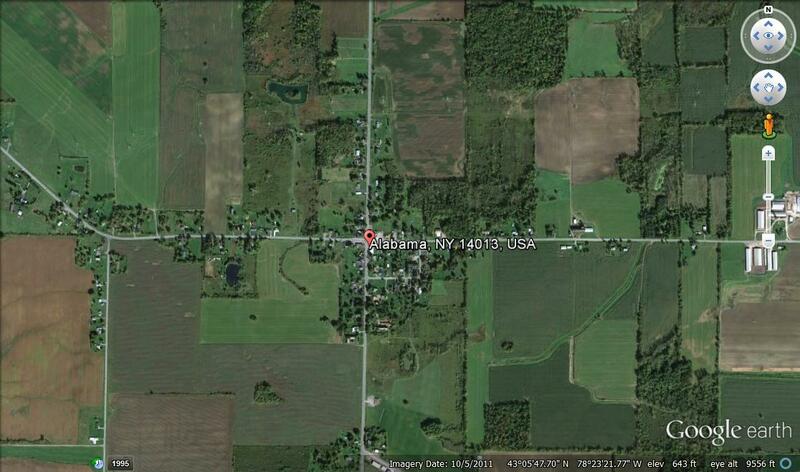 Alabama, NY via Google Earth. Alabama is almost exactly half-way between Rochester and Buffalo – almost an hours drive from either city – and is currently a little town of 1,800 that is an agricultural community and also home to the Iroquois National Wildlife Refuge. (Note to readers: the full-build cost of this Park is estimated to approach $400,000,000 or more). I guess our leaders just decided to split the baby on this one, instead of using the very substantial resources already at hand as a home to continuing investment and innovation. Iroquois National Wildlife Refuge, Alabama, NY. Photo by Zanjui. Great. Just great. Put the STAMP in one of the struggling upstate cities here, where there are resources, skilled workers, infrastructure, and plenty of available dirt? Nope – let’s start all over in a farm field, where there is no infrastructure, where you MUST drive to arrive, where the development will fail any test examining smart growth or smart investment. Nuts. A squishy perspective of the proposed STAMP development, top, and an image of the proposed park from TWC News, bottom. And so I got a bit cranky about this, and penned a letter to our local newspaper. They did not print it. They did print a piece by one of their staff writers, Sean Lahman, and he, thankfully, whacked the idea. This is a difficult time for our city and our region. We face budget gaps and dwindling public resources, high taxes, struggling schools, endemic poverty, and many other challenges that need insightful vision and creativity from our political and institutional leaders. We need to refashion our city into an engine of innovation, entrepreneurship, and cooperation, constructing a strong foundation for rapid urban transformation and future urban resilience. But with a recent announcement, it is clear our leaders have lost their way. 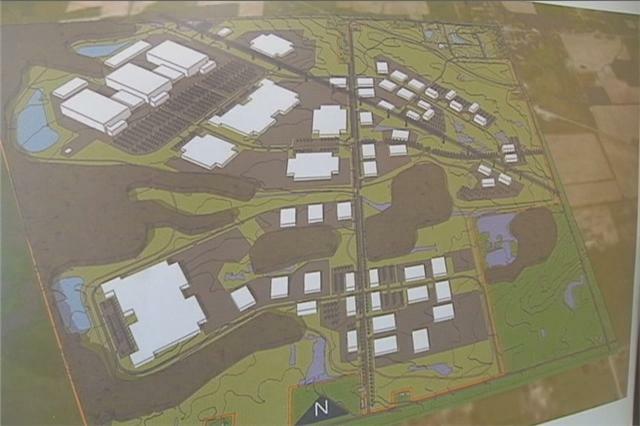 Our elected officials and economic luminaries tell us that a plan to construct a 1,200 acre Science, Technology and Advanced Manufacturing Park (STAMP) in Alabama, Genesee County, at a cost of $33 million is a big win for our region. In fact, this plan is destructive, ill-conceived, and mistaken. This park is not itself a bad idea. But it does not belong nearly an hour’s drive from Rochester, in a rural and agricultural setting, and adjacent to a National Wildlife Refuge. This park belongs in our city. Harvard economist Edward Glaeser tells us that “all successful cities have something in common. To thrive, cities must attract smart people and enable them to work collaboratively. There is no such thing as a successful city without human capital.” Rochester has that human capital: Rochester is home to nearly two dozen colleges and universities, with nearly 90,000 students. Rochester has long had a robust workforce of skilled innovators. And the human capital of our city can only increase, and assure the vitality of our city, if a STAMP is placed in our urban midst: accessible, bustling, sustainable without environmental compromise, with ideas and achievements feeding and inspiring one another. Rochester has the human and cultural infrastructure to populate and sustain a STAMP. And Rochester has the physical infrastructure as well. We do not need to build a brand new physical setting for innovation, with all its attendant costs and demands. The physical infrastructure for a STAMP is already here in our city. Eastman Business Park, now wanting for occupants, is just one example of an existing place ready to become a STAMP. Leaders, hear this: the time to build more sprawling green-field development, many miles from our existing human and physical capital, is over. We can no longer afford any economic, cultural or physical plan that is not firmly lodged in what is already our greatest asset: our people, our city. Bah. Humbug. Yet another step backwards. And now my TEDx talk from last November is up and on YouTube. Thanks to Tony Karakashian and the Rochester TEDx crew, and to WXXI for their editing work. As we wander around the world looking for cities that can teach us Rochesterians a thing or two about good urbanism, we occasionally stumble across places that are sufficiently astonishing that they must be shared. 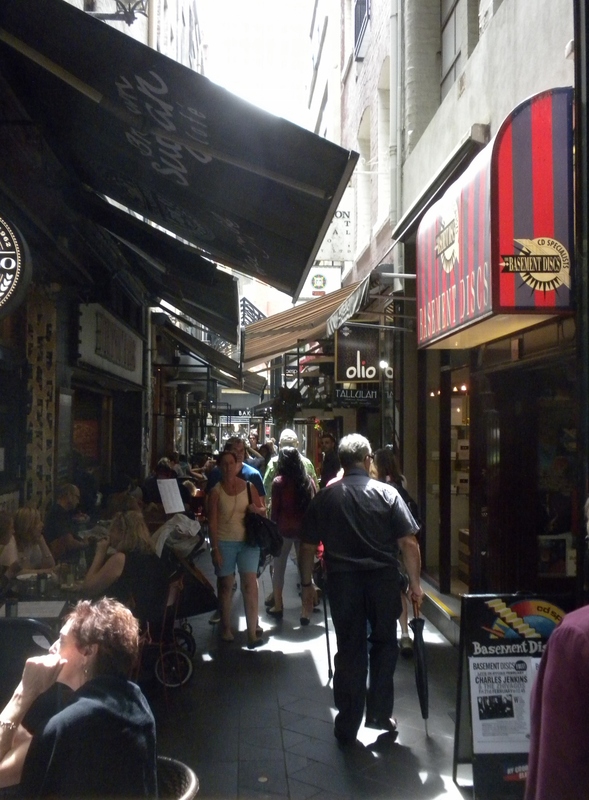 And so, herewith is a peek at Melbourne, Australia. 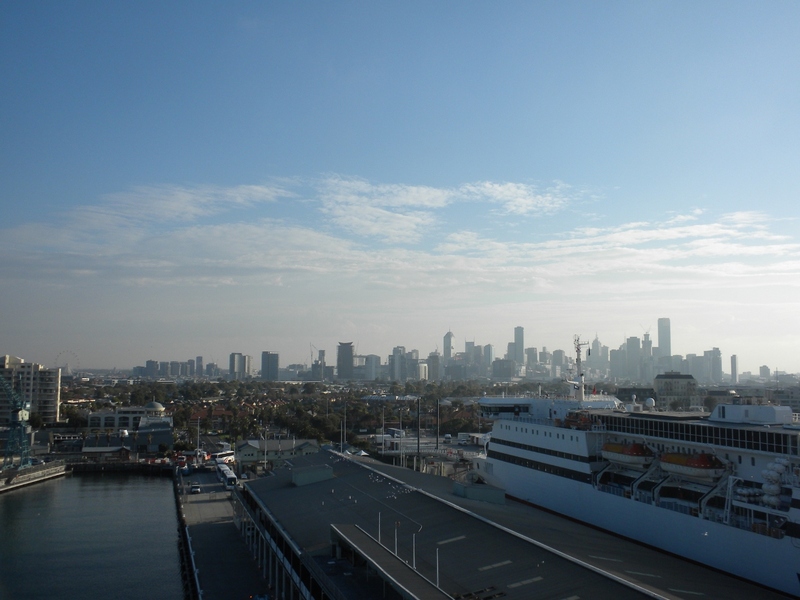 Melbourne, looking north from Port Phillip Bay and the Tasmanian Ferry Terminal. Melbourne is a big city, with a population of just over 4 million. And it has lots of things wrong with it – expressways that are traffic nightmares, new road construction, a fair amount of sprawl at the edges – although most but not all of this is industrial rather than the more conventional kinds of sprawl we’re used to – perhaps a few too many big sports stadia (though soccer, cricket, rugby, and tennis are all a stone’s throw from one another), a downtown shopping mall: most of the usual crud that affects almost all cities (if you want to see a real mess in the making, go spend a bit of time in and around Bangkok….). So at the very outset, let me be completely clear: Melbourne is not Arcadia. We have not discovered the Beulah Land. But…. We have been thinking quite a lot of late about what a city should look like and how it should be arranged in order to be better prepared for the changes ahead. What changes, you ask? Well here are a few: very soon there will be lots more people, fewer resources and some scarcities, less wealth, our mobility will be different (less actual movement, more movement via technology), there will be fewer cars, energy will be more expensive, the weather will be different, food will be more expensive, local will make more sense (cost, availability) than trans-national or global. When you ask? Oh, any time now. But back to Melbourne, mostly ready for its future. During our recent visit we had the great good fortune to be guided and toured about the city by friends who have lived there for many, many years. Not architects or urban designers – phew – but smart people who are quite tuned in to their home place. 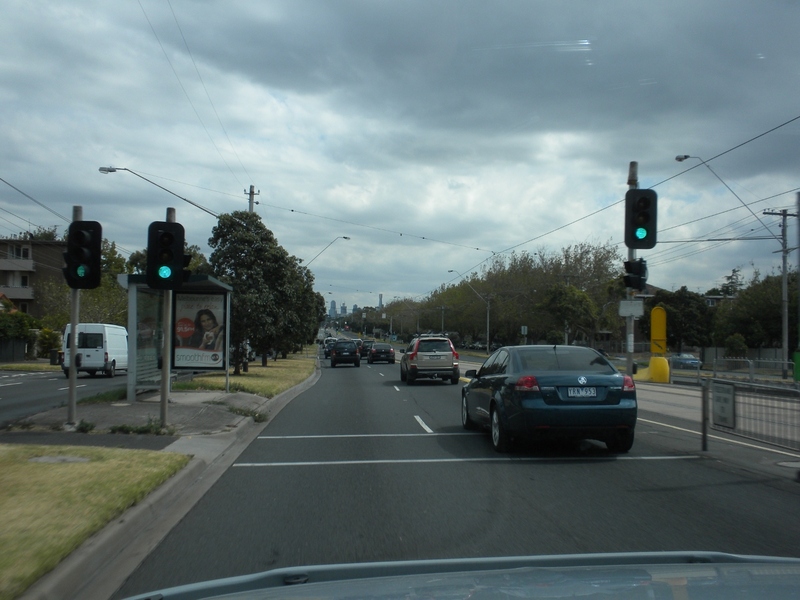 So we saw a lot, and a lot that most tourists would never see: traffic jams, city edges, many of Melbourne’s beautiful and huge parks, the close-in suburbs, neighborhood nodes and their shopping zones, and more. Not to say our visit was comprehensive by any means, but we did manage to get to most corners of the city. And – wow. Afoot on downtown Melbourne’s Swanston Street. 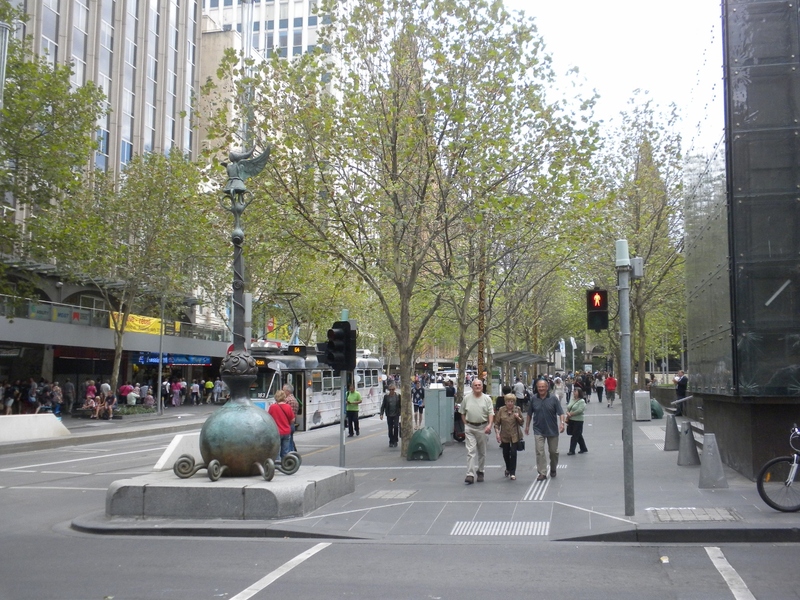 Before we reached the gridded and bustling downtown of Melbourne, we took a look around at some of the edges. 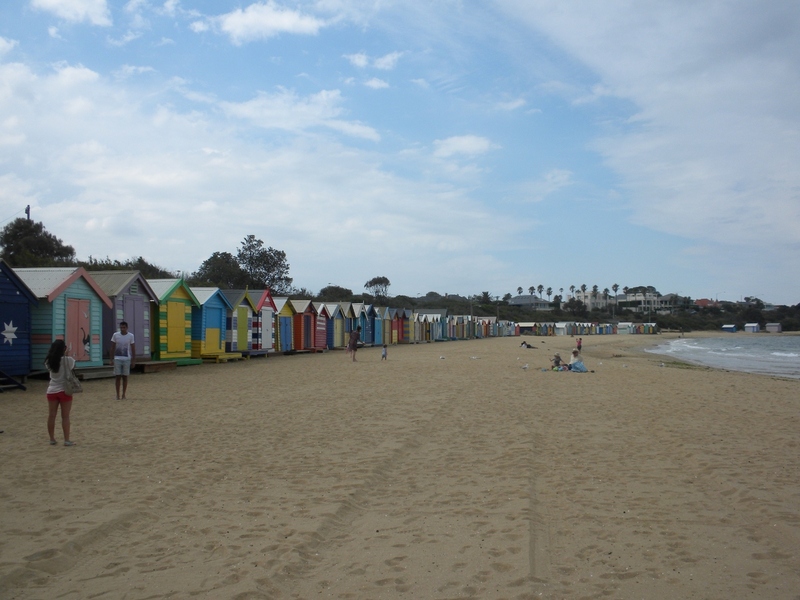 In a southeastern suburb (though if felt a part of the urban fabric and was only 6 or 7 miles from downtown, and near the city’s edge) of Brighton, we visited the famed Dendy Street Beach, with its amazing and iconic bathing boxes – 82 of them. These cabanas – colorful shacks, really – are now selling for $250,000 each – 10 years ago you could get one for $12,000. As we had a bit of breakfast, our guides (unprompted from us Rochesterians, honest) animatedly told us about their neighborhood in Brighton, and excitedly about their 20 minute commute to downtown. (20 MINUTE COMMUTE – SOUND FAMILIAR, NEIGHBORS?!?). They often grab their grandkids and travel about the city for 20 minutes in one direction or another to a park (the Melbourne parks are an amazing asset) or a museum or downtown to Federation Square (more about that place shortly) on the streetcar. 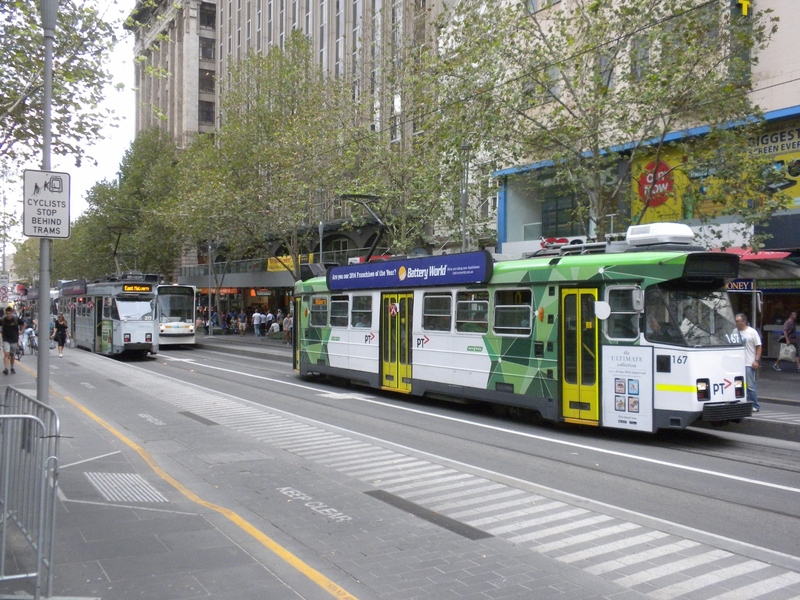 Yup – in Melbourne the 20 minute commute is on a streetcar. 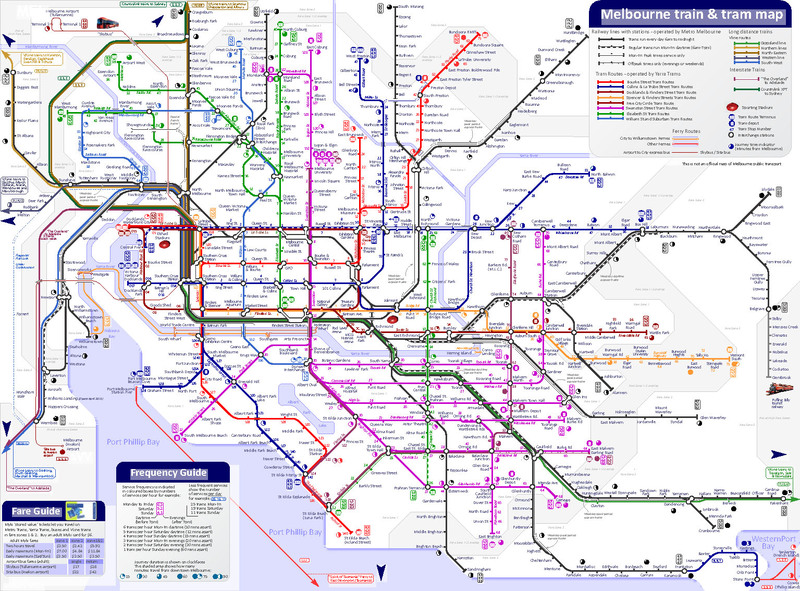 Take a look at the Melbourne train and tram map – it’s truly awe-inspiring! 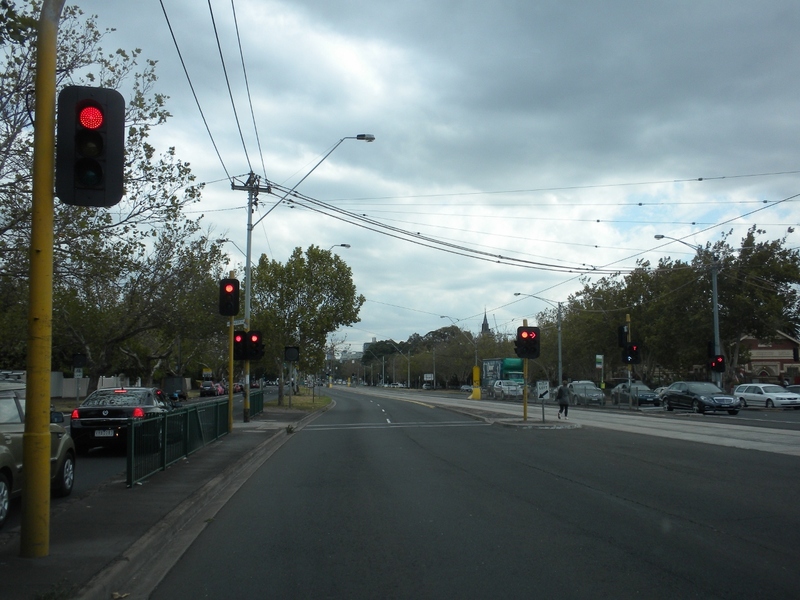 And now let’s take a trip down St. Kilda Road and head downtown. The street is wonderfully subdivided into a three part boulevard section: part one is for the streetcars; part two is for through traffic and is adjacent to the trams; part three are the service drives for local access and turning movements. Brilliant. Variations on this theme are visible in various parts of the city on major routes, while the trams simply share the rights-of-way in the more dense neighborhoods. Truly, a transit geek’s paradise. And as the map above illustrates, mobility in Melbourne is more than just trams. The system is a coordinated network of various modes – trains, trams, buses, and more. A network – that’s how it’s supposed to work, right? And thus, a 20 minute commute. But onward. 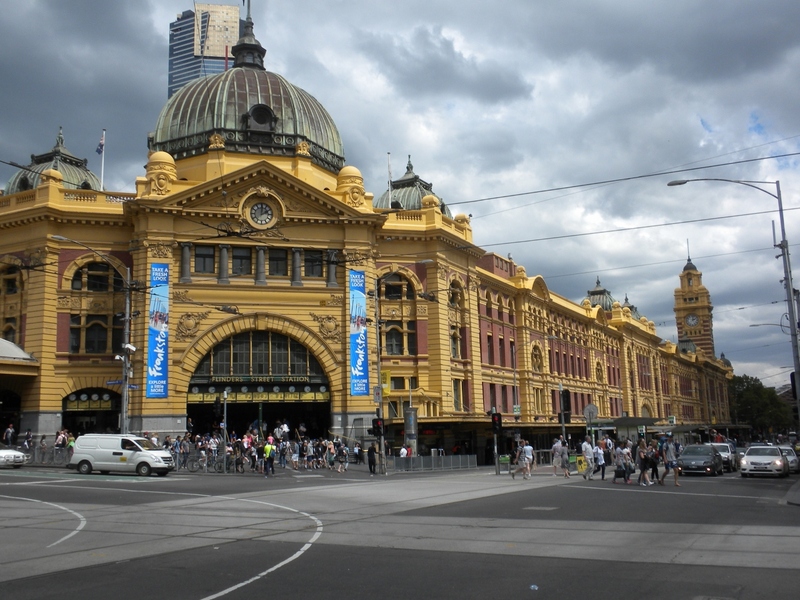 Arriving downtown, perhaps by tram or train, we find ourselves at the astonishing and beautiful Flinders Street Station. 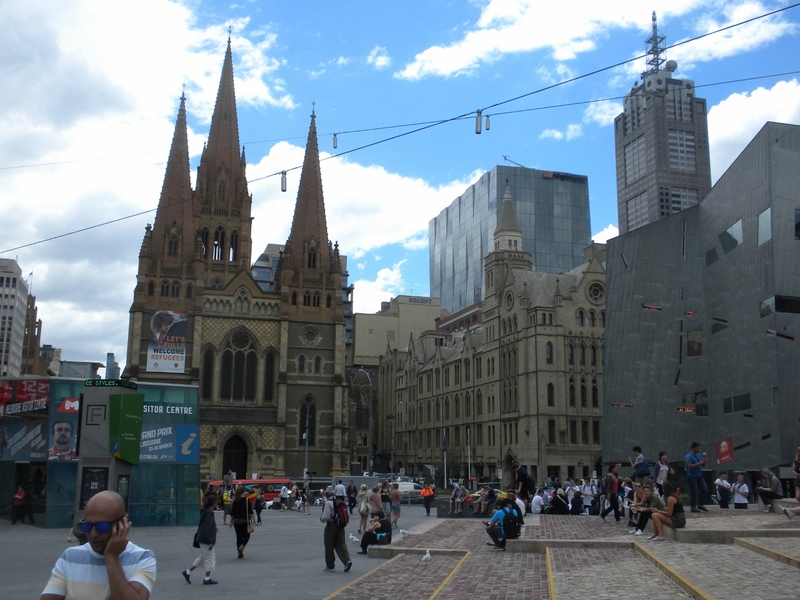 And across the street from the station is the city’s main public space, the very odd but entirely tractable, crowded, bustling, and beloved Federation Square. Federation Square is actually a large mixed-use development housing many public and some private functions, museums, retail and restaurants, all built on air rights over the railroads. The buildings are weird, but they frame an amazing and wonderful space that is the living room of Melbourne, and a great jumping off place for a downtown stroll. 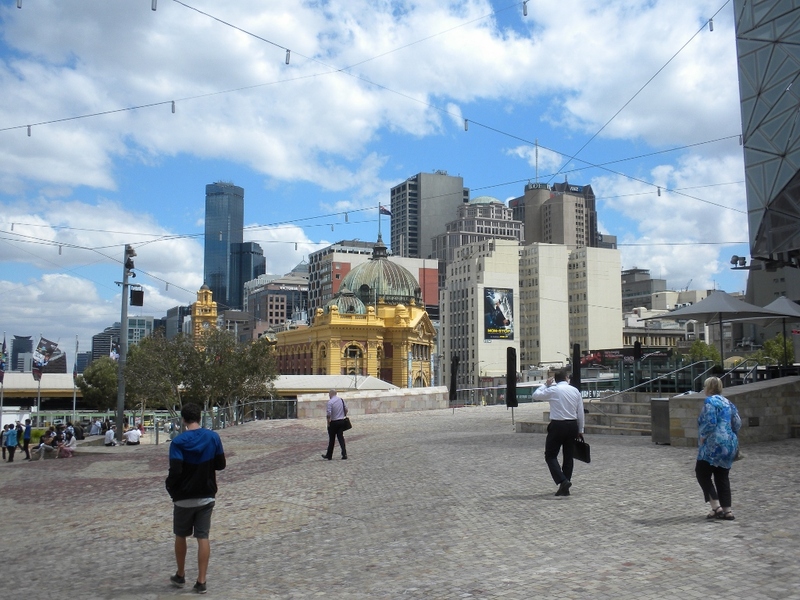 Flinders Street Station and downtown Melbourne from Fed Square. St. Paul’s in the background, Fed Square bustling all round, and the weird architecture visible at the right. After a Fed Square lunch, it’s time to have a walk. 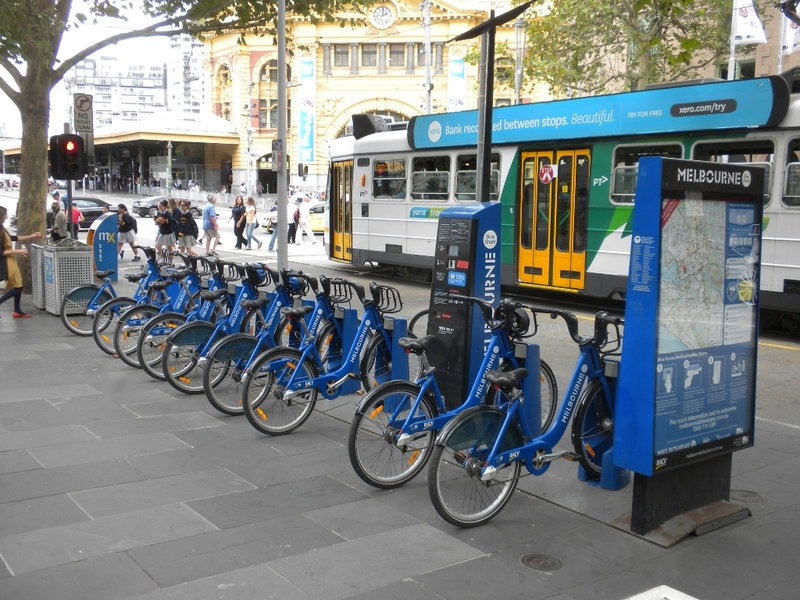 Yes, the mobility network includes bike sharing. 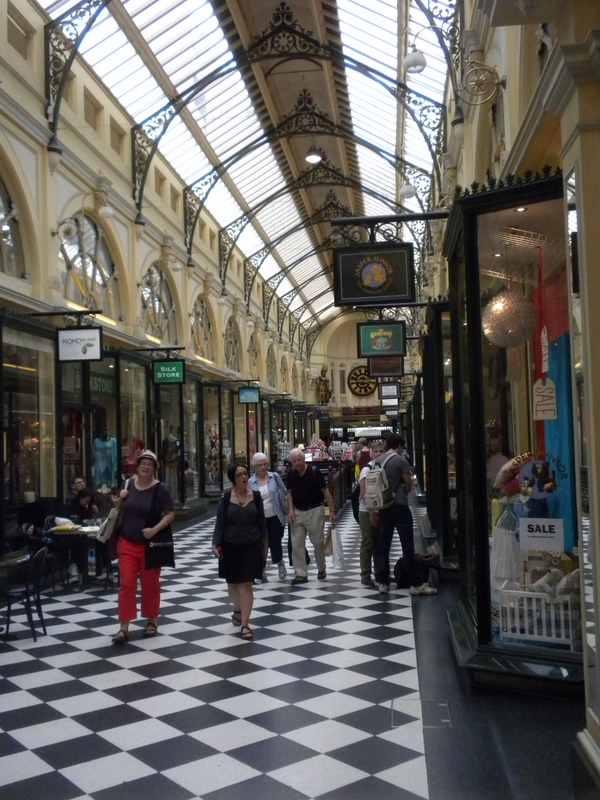 As if the streets are not wonderful enough in what is called the Hoddle Grid, because downtown was laid out in 1837 by Robert Hoddle in the form of a rotated grid, there are a whole host of fabulous arcades. 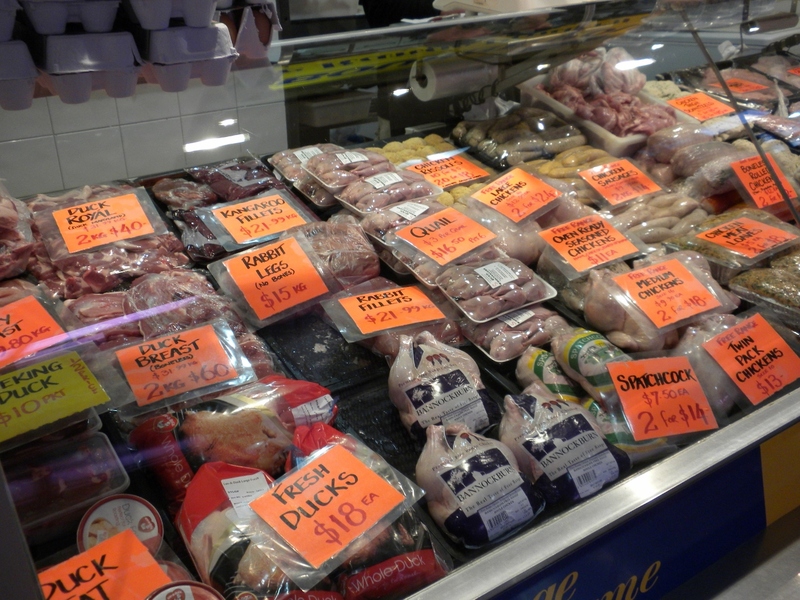 And bunches of snickets – mid-block narrow walks lined with food and shops. 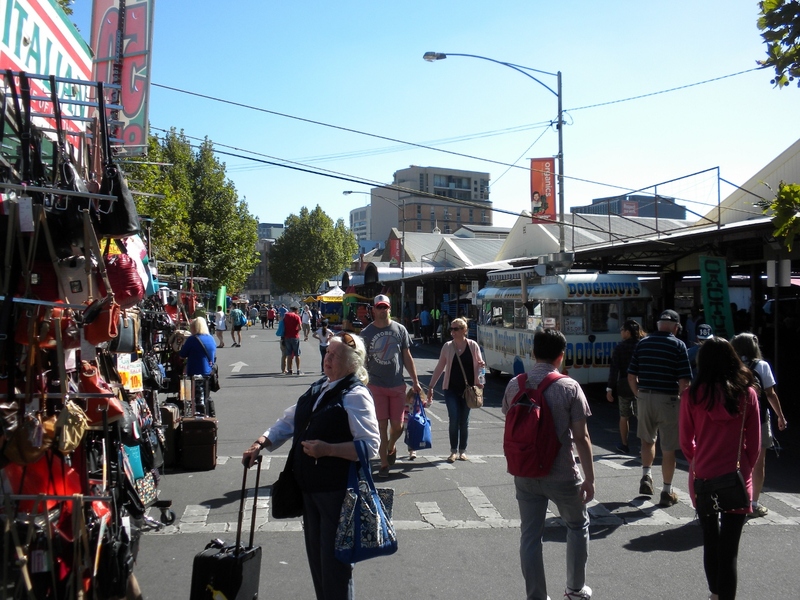 We enjoyed everything about downtown, and we were completely taken as well by Melbourne’s equally amazing neighborhoods. Cities can be terrific places. The doughnuts are a much prized Vic foodstuff. 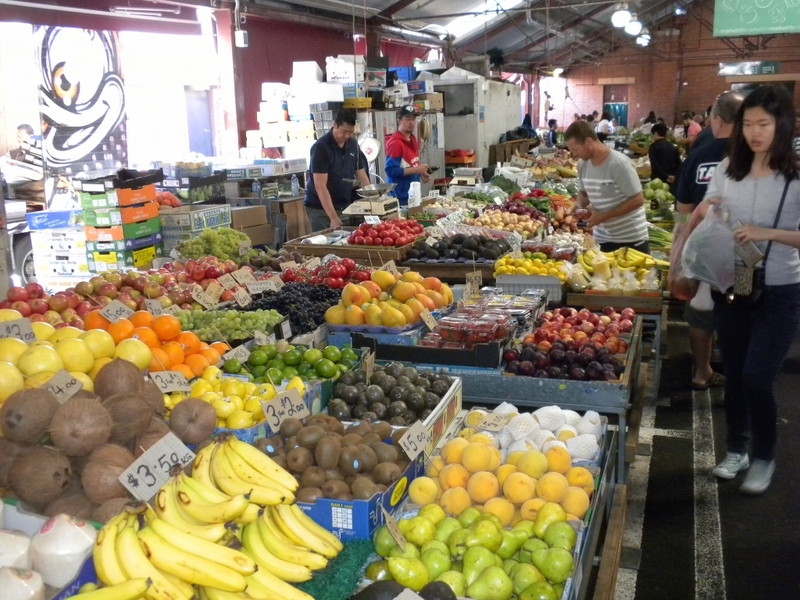 Miles and miles of the real stuff of markets – fruit, veg, cheese, meats. 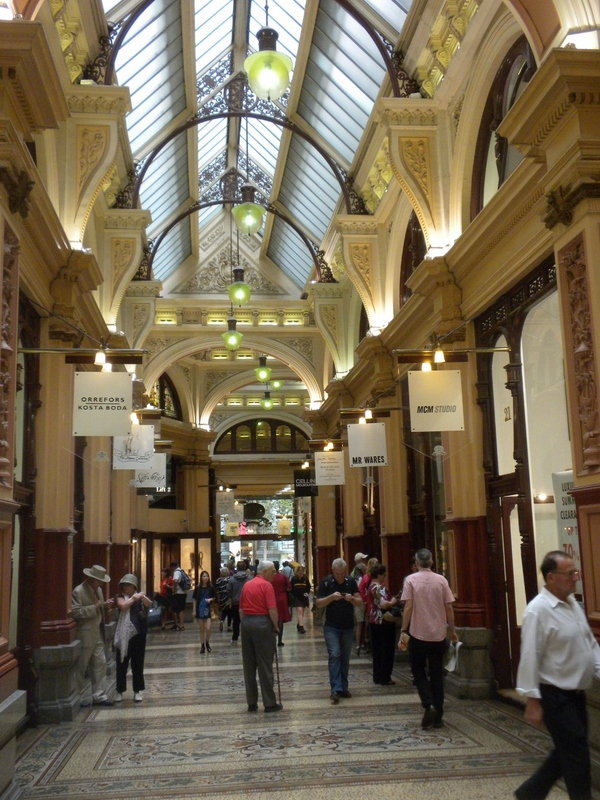 Go to Melbourne and see for yourself – it’s worth the trip.